I’ve always been a routine kind of person. I need stability, organisation and a sense of what is coming next. This is something that has been passed onto how I raise my child too. 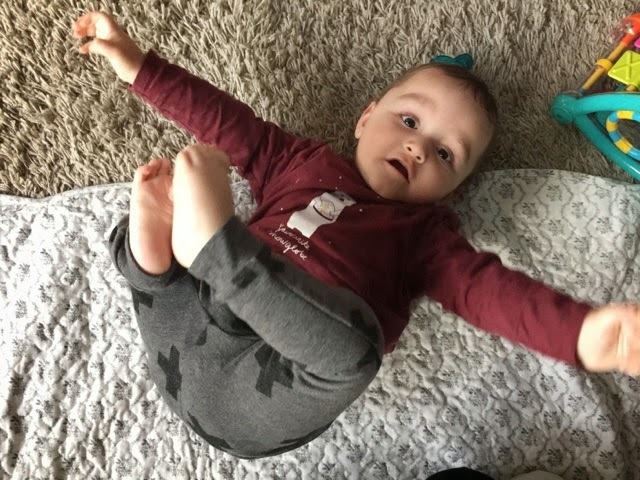 I really do believe children thrive when their in a routine, I’ve started to follow Gina Fords Contented Little Baby routine and so far it’s working a treat! I thought I would share our current routine. 6.30am We are woken up to a very chatty Max. One of us usually brings Max into our bed just so we can try and catch a few extra winks. This is never the case though, Max usually ends up slapping our faces or kicking us with his legs. 7am is nappy change time. He’ll also guzzle down 8oz of milk. Max will then play with his toys or roll around on his playmat whilst I make myself a coffee and watch the news on TV. By this point Freddie has already left for work. 8am I start preparing our breakfast which is usually porridge, banana slices and toast. 9am with breakfast sitting comfortably in our bellies it’s time for Max to have a snooze. Whilst he’s napping this is a chance for me to spruce up the flat, shower and get myself ready for the day. I’m also into my second well and truly needed coffee by this point! 9.45am Max is awake by now, his first nap of the day tends to be quite short unless he’s had a rough nights sleep. I’ll spend the next 15 minutes in a wrestling match trying to get him dressed and ready for the day. 10am Max will have his second bottle which is usually around 6-7oz. He’ll have this bottle as we rush out the door to our morning baby class. Here’s a post all about what classes we attend. 12pm and we’re back home and ready for lunch. Max will have a meat puree with a Little Yeo’s yogurt dessert and if he’s still hungry (which he usually is) he’ll have a breadstick or carrot puff too. 1-3pm is when Max will have his longest nap of the day (Whoop!) this is the time for me to prepare my lunch, sip on a hot latte, blog, relax and watch TV or do house chores. 3pm and he’s awake! Nappy change and 7oz of milk later, Max plays with his toys whilst I get everything ready for our walk to the river. 3.30pm and we’re off out to the river where we’ll either feed the birds or head to the swings. I’ll also pop into Sainsbury’s to grab supplies for tonight’s dinner. 4.30pm we’re back home. Max is sat in his highchair with either a few fruit/veg finger foods or he’ll have a toy to play with whilst I pack away the shopping and make myself a cup of tea. I also start preparing Max’s dinner which is usually a vegetable puree and fruit puree dessert. 5pm and it’s feeding time at the zoo. 5.30pm Max watches a bit of Disney has a roll around on his playmat with his toys. 6pm whilst his bath is running we lay on the bed and read a couple of books together. Max’s current faves are Dear Zoo and That’s Not My Hamster. 6.20pm and Max is in the bath kicking and splashing away. 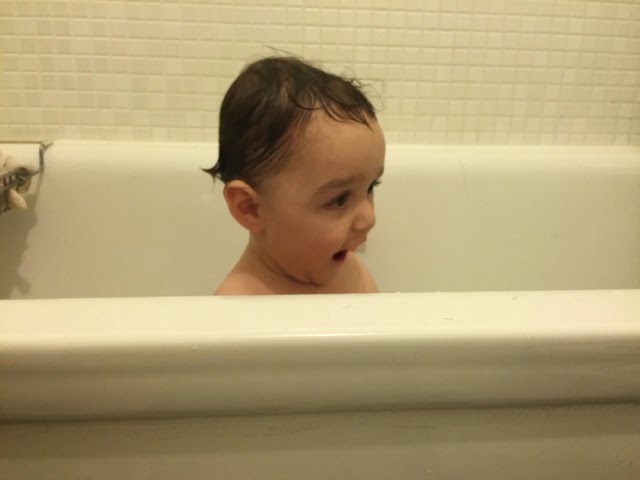 He’ll usually stay in the bath until he’s all bath timed out. 6.45pm lights are dimmed, there’s no noise whilst I give Max a relaxing baby massage. Once he’s in his onesie he’ll have his 9oz bottle and put straight in his cot. Max is exhausted by this point and will head off to sleep pretty much straightaway. 7pm I collapse on the sofa! So this is our day to day routine obviously this routine isn’t always the case as it really depends on when Max wakes up etc but we do try and follow this routine where we can. What’s your current routine like? Long nap time? SO jealous! I'm with you on the structured day! I feel lost if I don't have some sort of organisation – and I can tell Aria is the same! Our routine is very similar now, except for the amount of milk and that second long nap… What's your secret?! What kind of meal purée do you give Maxy? I'm looking for more inspiration for Aria!